Don Bailey has recorded for Summit, Genuin, Parnassus, and Albany Records. In its review of his debut CD Voyage, American Record Guide praised his “impeccably controlled sound… full of artful colors and nuances…exceptional attention to detail…unfailing precision”. Fanfare said his Tribute CD was “…a delight from beginning to end… Bailey boasts a brilliant technique and a bristling sense of excitement.”. A native of Clarksdale, Mississippi, Don began his career in Dallas, Texas, where he performed with the Dallas Chamber and Bach Orchestras and Voices of Change. He is a former university professor, board member of the Greater Dallas Youth Orchestra and New York Flute Club, and past president of the Texas and Louisiana Flute Societies. Following a 20-year residency in New York City, he is once again based in Dallas. He is Director and Flutist of Voyage Unlimited, Inc., a New York not-for-profit committed to the performance, recording, and publication of new and standard chamber music for flute. As solo flutist with Classical Quintessence aboard the Cunard cruise ship Vistafjord, he performed with Polish pianist/composer Adam Manijak, who has become an integral part of the Voyage Unlimited mission. The Voyage Unlimited Series of new orchestrations by Don and Adam is published by Falls House Press and distributed by Theodore Presser. Don performs with collaborative pianists Donald Sulzen of the Munich Piano Trio, Dianne Frazer of Louisiana State University, and previously with the acclaimed Attacca Quartet, formed at The Juilliard School in 2003. He has performed in Alice Tully and Bruno Walter Halls in Lincoln Center, Columbia Artists Management (CAMI) Hall, New York Society for Ethical Culture, and Munich’s Gasteig among others, and live for WNYC radio at Symphony Space. He performed on the American Landmark Festival series with New York pianist Leslie Jones, and reaching out to an even wider audience, he performed in a Manhattan showcase of “world music” blending Afro Cuban, Brazilian, Spanish, Italian and Columbian styles with composer, film-scorer and guitarist Christopher Caliendo of Los Angeles. Other performances include those with the Aspen Festival Orchestra, the Dallas Chamber Orchestra, the Dallas Bach Orchestra, the Shreveport Symphony, and Voices of Change. Working closely with legendary composer Gian Carlo Menotti at his home in Scotland, Don compiled a chronology of the composer’s works. 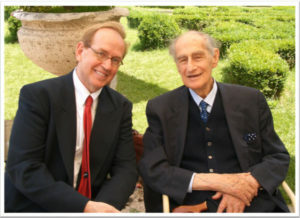 As Menotti’s guest at the Festival of Two Worlds in Spoleto, Italy, he co-curated and performed on the Concerti di Mezzogiorno and Umbria Segreta chamber music concerts, sharing the stage with the Attacca Quartet and celebrated pianist Jean-Yves Thibaudet, among others. In February 2007, he contracted members of the Dallas Symphony Orchestra and Dallas Opera Orchestra and recorded Menotti’s The Old Maid and the Thief, produced by Lone Spring Arts. The CD was released December 1, 2007 by Albany Records. 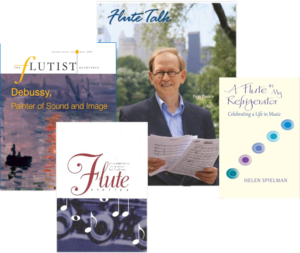 Don’s articles have been published in national music journals including Flute Talk magazine, Flute Forum, and The Flute View. 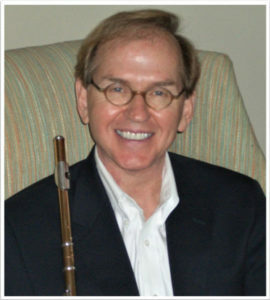 He has been interviewed by several publications, including Windplayer magazine’s best seller Flute Stories, “101 Inspirational Stories by the World’s Best Flute Players”, The Flutist Quarterly, “The Musical Road Less Traveled”, and A Flute in My Refrigerator, “Celebrating a Life in Music” by Helen Spielman. He is also the cover interview of the September 2008 issue of Flute Talk magazine. Don completed his Masters and most of his DMA at the University of North Texas before accepting his first university teaching position in Louisiana. He continued his studies at the Aspen Music Festival, and the Académie d’été in Nice, France. His teachers include the distinguished flutists Julius Baker, Harvey Boatright, Michel Debost, Sharon Lebsack, Alain Marion, Judith Mendenhall, George Morey, Marcel Moyse, and Albert Tipton. His flute is a handmade 14-karat gold Brannen-Cooper.